A combination of pork fillet and pastry in its ‘Pork Wellington’ has earned Archers Butchers the prestigious ‘National Champion’ title at the 2011-2012 BPEX regional roadshow and product excellence final. It was the first time the Norwich-based butchers had entered the competition. The speciality product triumphed in the first leg of the 2011-2012 season. Along with the seven other champion products from each region, it was put forward for one final taste test by members of the public who were unanimous in their decision. 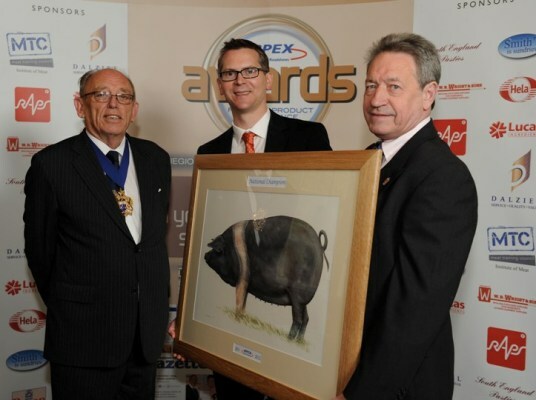 A delighted James Archer picked up the award, which was an original watercolour painting of a Saddleback pig by artist Chris Pendleton. The butcher, who followed both his father and grandfather into the trade, said: “I’m absolutely thrilled! This is real credit to the team at the shop. We were blown away to get the regional champion award and be in the top eight, so to come away with this national title is an honour as well as a complete shock! BPEX butchery and product development manager, Keith Fisher, said: “When the judges first came across the Pork Wellington at the roadshow they were extremely impressed and our panel of national judges agreed. It really is a very worthy winner and proves that pork performs just as well as other meats in some of our most favoured classic dishes. At a time when pork delivers good value for money, butchers are coming up with some very innovative ideas that are clearly paying off. James Archer (centre) accepting his prize from Ray Woodhouse, Master of the Worshipful Company of Butchers and Keith Fisher.